James Andrew and Ruth Newton Baggett papers, 1917-1919, undated (#3876): Comprised of letters and photographs written during James’ service in the United States Army during World War I.
Billie Huggins Harrison papers, 1923-1997, undated (#3906): Contains scrapbooks documenting Baylor campus life for a female student in the 1930s and 1940s. L.L. Johnson papers, 1908 (#3905): Class lecture notes compiled by L.L. Johnson, a student in a class taught by Benajah Harvey Carroll. 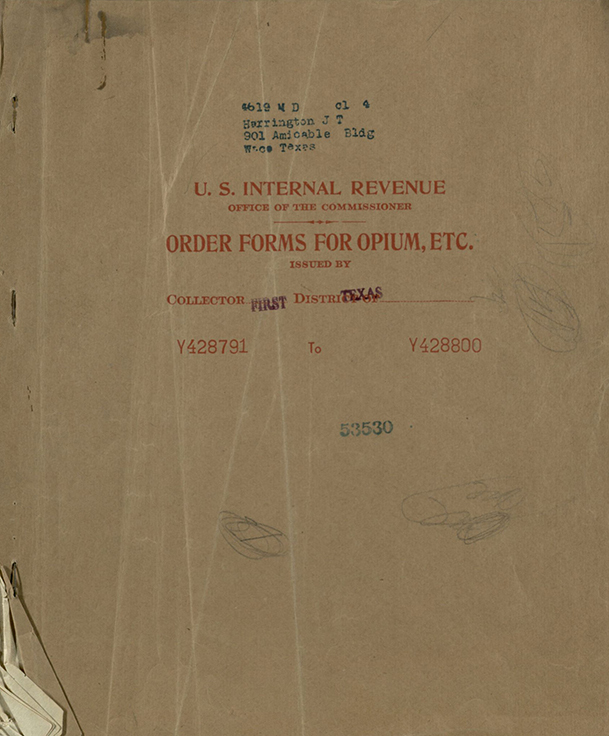 Virgil Hoyt McClintock papers, 1911-1952, undated (#3912): Case files, photographs, and scrapbooks relating to McClintock’s judicial review of Nazi war crime cases. 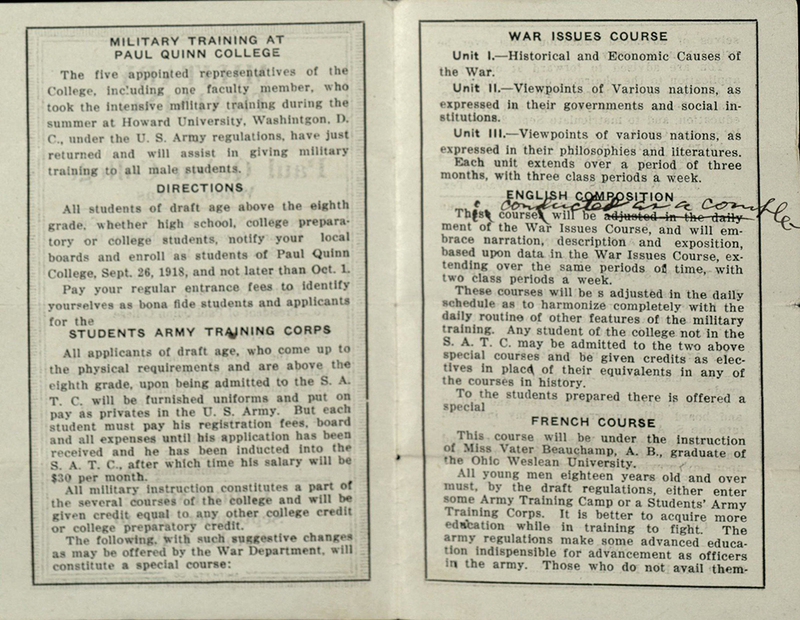 This pamphlet shows the military training Paul Quinn College students received during World War II. John H. Talton papers #3082, box 1, folder 7. BU records: Movement for the Perpetuation of Baylor at Waco Committee, 1928 April-November (#BU/122): Letters and newspaper clippings documenting the proposed move of Baylor to Dallas and efforts to keep the university in Waco. Wade Hill Pool papers, 1878-1941, undated (#76): Legal documents and literary productions related to the life of Professor Wade Hill Pool, a Latin professor at Baylor University. Annie Keeling Randle papers, 1919-1928 (#2545): Contains copies of two plays written by Randle, an influential member of the black community in Waco throughout the twentieth-century. John H. Talton papers, 1914-1968, undated (#3082): Includes letters and ledger books related to the life of John H. Talton, a history professor at Paul Quinn College when it was located in Waco, Texas. Waco Public Library Association records, 1856-1925, undated (#2041): Traces the formation and continuing operations of the first Waco Public Library, funded in part by philanthropist Andrew Carnegie. Dr. Harrington’s papers documenting his early twentieth-century medical practice include paperwork tracking his orders of morphine and other painkillers–we imagine this would look familiar to modern doctors! John T. Harrington papers #728, box 1, folder 9. If you lived in Waco in the late 19th and early 20th centuries, chances are you would have known Dr. Harrington. A well-known figure in the area, John Thomas Harrington, Jr. was not only a dedicated physician but also lived a very accomplished life. He dabbled in a variety of vocations, including oil, gold, and dairy. He also took part in founding colleges and serving on trustee boards (including the Baylor University board, on which he was one of the longest serving members). His dedication to his medical career is quite evident in his papers, more than any of his other interests. The majority of the John Thomas Harrington papers are made up of medical practice materials that span his many years in the field. Born in Mississippi in 1858, Harrington began his medical career with an education at Louisville Medical College. However, one medical school was not enough and he went on to both the Medical School of St. Louis and the New York Polyclinic Medical College. 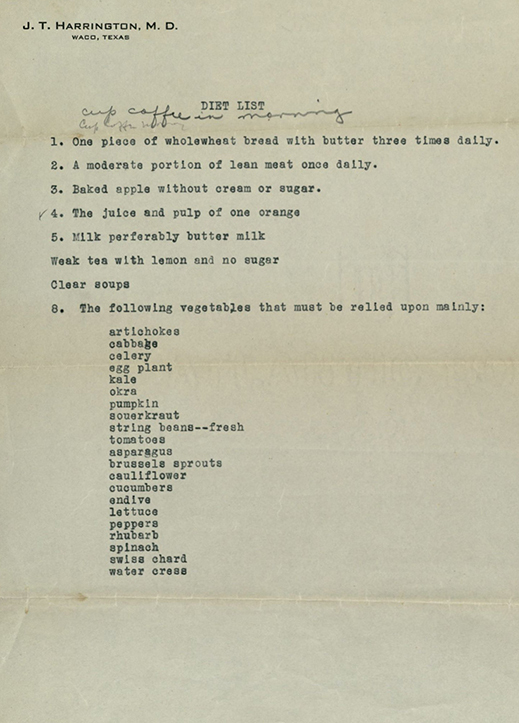 Dr. Harrington’s suggestions for a healthy (though not terribly exciting) diet. John T. Harrington papers #728, box 1, folder 9. 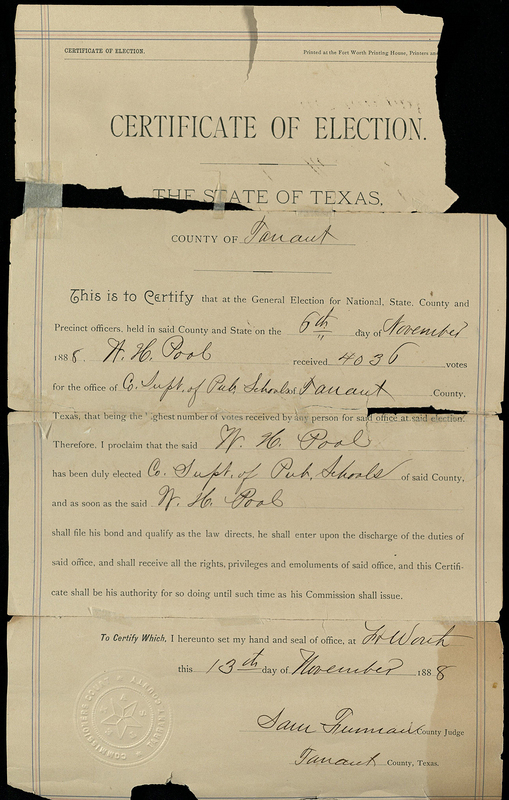 After he moved to Texas he began building a reputation for himself as a doctor, serving as president of the board of health at El Paso and the director of the epileptic colony at Abilene. In 1897 he moved to Waco, where his list of achievements continued to grow. Here, he worked on staff at both hospitals in town, organized the McLennan County Medical Association, co-founded Baylor Medical College, and served as the city physician. As a physician, Dr. Harrington worked out of a home office where he saw patients regularly. Some of these patients even included Baylor presidents. And if you head down Eighth Street today, you can still see his home (currently owned by Baylor University). But medicine wasn’t everything to Dr. Harrington; he was also a family man. Harrington married his wife, Genoa Cole, in 1884, and together they had two daughters, Genoa and Jessie. Through journals, academic notebooks, correspondence and notes, we are able to get a small glimpse into the life of the Harrington family. 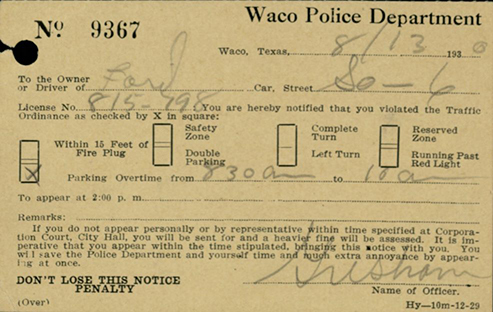 Even the good doctor incurred a few tickets in his day–here, we have a parking infraction downtown in 1930. John T. Harrington papers #728, box 1, folder 6. These documents and photographs that make up the Harrington papers are a testimony to the impact he made in Waco throughout his lifetime. Through his position as city physician, he made a great contribution to the public, and the greeting cards, invitations, and programs included in his papers illustrate his high level of involvement with the community. The Texas Collection has the privilege of preserving Dr. Harrington’s documented life, and for all those interested in studying a noteworthy physician of Waco, this collection would be an excellent resource. Guest blogger Becca Reynolds processed the Harrington papers as a student in Dr. Julie Holcomb’s spring 2014 Archival Collections and Museums class. Reynolds, who holds a B.A. in History from Azusa Pacific University in California, will begin her second year in Baylor’s Museum Studies master’s program in fall 2014. She is currently working as a summer intern for the education department of the Sharlot Hall Museum in Prescott and will continue working as a Graduate Assistant in Education at the Mayborn Museum Complex throughout the fall semester.